Germany deliberately starved occupied Soviet territories by plundering their food for German use. This was the “Hunger Plan”, which starved to death millions of people. It was in part a practical decision to have German forces live off the land, but it also fit nicely into German plans to exterminate the population of the Soviet Union. And this makes this photo particularly poignant. This is a good man who has no idea that his role will ultimately make his gesture futile and starve them to death anyway. This photo was taken in 1941 by the photographer of the 291st Division of the Wehrmacht George Gundlach. One of the many, out of the photo album “Volkhov’s battle. Documents of horror 1941-1942″. The soldier in the picture was part of 291st Division of the Wehrmacht. The tents were made from shelter quarters, which each man carried, with an aluminium central pole that fitted through rings in the corner. The tent wasn’t so waterproof, and that’s why the helmet is resting on the pole, to prevent the rain going inside. The Wehrmacht engaged in plenty of deliberate mass killings, especially on the Eastern Front. Hitler literally declared the war with the Soviets a war of extermination, and gave every Wehrmacht officer the power to execute without trial. The Wehrmacht also often closely cooperated with the SS in the rounding up and execution of Jews under the guise of anti-partisan actions. The “Guidelines for the Conduct of the Troops in Russia” issued by the OKW on May 19, 1941 declared “Judeo-Bolshevism” to be the most deadly enemy of the German nation, and that “it is against this destructive ideology and its adherents that Germany is waging war”. The guidelines went on to demand “ruthless and vigorous measures against Bolshevik inciters, guerrillas, saboteurs, Jews, and the complete elimination of all active and passive resistance”. For example, the Wehrmacht would mass execute civilians if one soldier was killed by a partisan (civilian fighting guerrilla warfare). Wooooah you could have just written about the photo and not go on to share this romantic Hollywood viewpoint of WWII. We all sucked it up and repeated it 1000 times to ourselves since Kindergarten. All we care to listen about is the soldier in the photo above what's happening in the photo. Exactly, and Stalin starved to death his own people, not just in Ukraine (Holodomor). 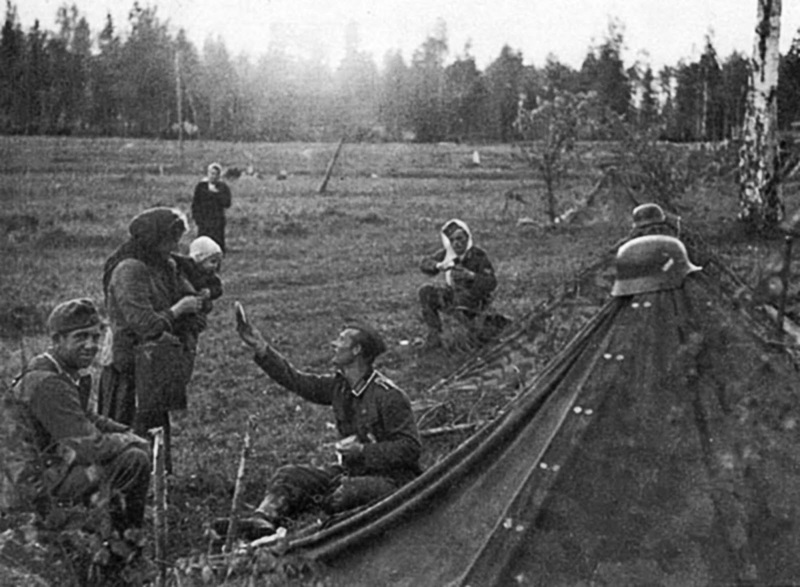 Actually, Germans even got backup from the Russian civilian population. Only when they faced some cowardly partisans who tried to shoot them from behind and who used civilians as human shields by hiding in their houses, they got mad which should be something people should understand. Agree with above comment, or below (Karl, Jan28, 2014). Please keep the editorializing to yourself. This forum is "rare historical photos" not personal opinions of people posting them. You have a right to your opinion, accurate or not; just please refrain from posting material totally irrelevant to the picture posted. This is called the "comments" section. As with any comments section, it is here to encourage discussion and an exchange of opinions inspired by the photograph, which is the point of "photojournalism". It isn't an art museum. Who the hell do you think YOU are, that you have some kind of power to come into a public forum and tell people what they can and can not say? Doesn't take too much insight to see by your "orders" that you're quite the a**hole, which I absolutely have no doubt that you have heard before. Bet you have also heard "STFU" before, no? I think it presupposes (correctly) the thought that many people believe the Wehrmacht were the soldiers that did the fighting and the SS were the ones that did the executing. And the story behind the photograph is important. Furthermore, where is he listing opinions? I am confused. It's called "Rare Historical Photos, and the stories behind them." If you can't stand to read, do a google image search. Or appreciate the purpose of this webpage, you ignorant goons. Great photo and thanks for the article! Obviously judging by some of the comments you have struck a nerve! GOOD! We should NEVER forget! Germany's 'economic management plan' stripped the food resources from the occupied Soviet territories and used them to feed the military or shipped them back to Germany. It subjected much of the Soviet population, particularly in large cites, to starvation. This effect was foreseen and no attempt was allowed to avoid it. The article suggests that, in addition to the Red Army, Jews, Communists, and anyone suspected of posing trouble to the occupation, the German military was charged with waging a "war of extermination," wherein, by starvation or bullet, they must kill all passive Russians, Belorussians, and Ukrainians in the occupied lands. This is not historically accurate. The anecdotes of atrocities and evidence of harsh policies taken against segments of the population offered to bolster this erroneous assertion do not make it any truer. Certainly German policies and practices were reprehensible enough without needing cartoonish embellishments. So this particular soldier was good, although he was in a Wehrmacht division and they were all evil? I don't get it. Jens, the thing is, there were millions of good soldiers in the Wehrmacht. But also a minority -- relatively small minority! -- of bad apples. Total number of persons that served in the Wehrmacht was 17,893,200. The number of persons that served in the "Einsatzgruppen" in 1942 was 15,000. I don't have any later numbers, but even if this number had doubled, how many % of the entire Wehrmacht were they? I read a Nazi slogan: "3000 will kill 3 million" referring to actions in the Soviet Union. It were the "soldiers" in those Einsatztruppen that committed the terrible atrocities. Behind the soldiers that fought on the front. Those 17 million plus had no idea. That included my dad -- in the Wehrmacht from September 1, 1939 until his surrender to the Soviets in Berlin on May 2, 1945 -- who was very upset when he heard of the assassination attempt on Hitler in the summer of 1944. When he learned after the war what Hitler had done, he said to me: "My God, why did the assassination attempt go wrong?" That ratio of good to bad apples was similar or fractionally higher for the entire German population. The number of people who "knew" was certainly somewhat higher, nobody really knows. Point in case, all my family members didn't know about the Holocaust, they only learned about it after the war. Except for one, he was locomotive engineer of a train that transported Jews to Auschwitz. After his third tour he knew what was going on. He never told anyone, not even his wife. Why not? He was afraid his wife or someone else would talk and if the Gestapo would find out, they would have ended up in a concentration camp themselves. The picture says it all, the rest is just propaganda.